Last Saturday I had a back to back Sondheim viewing.......a double header of Sunday in the Park with George and Gypsy. 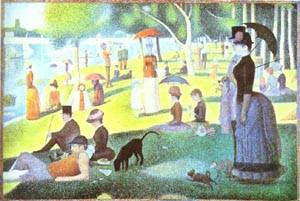 Sunday in the Park with George is a cleverly written fictional story of the painter George Seurat. Act 1 centers on creating his painting A Sunday on La Grande Jatte (pictured below and which incidentally is in the Art Institute of Chicago) and his relationship with his muse and lover, Dot. But aside from that, it also gives snapshots of the life of the people that make up the painting, the boatman, the little girl and her mother just name a few. Act 2 is set in the 1980's where we now see Seurat's grandson George, who is also an artist and his daughter Marie, George's grandmother. The musical centers on the need for connection.......to one's work.....to one's audience and most specially one's loved ones. It emphasizes what an artist gives up for their art and thus the words in the song "Art Isn't Easy". It's Sondheim's homage to art and creativity. For me, the show has good music which echoes the pointillism aspect of Seurat's painting but it's also a difficult show to see as you really have to listen to the lyrics to fully grasp it. Mr. Sondheim really makes his audience work in his shows. Daniel Evans plays George in both acts while Jenna Russell plays Dot/Marie. They are Brits imported from the London production of the same show. Mr. Evans played the role really well because I found myself really frustrated with his George in Act 1 with regards to how he treats Dot but at the same time understand his obsession with getting his painting just right. Ms. Russel is incredibly moving as Dot specially in the last scenes at the end of Act 1. I must say though that there were some times I couldn't hear her over the orchestra which was located on the box, stageleft at the level of the mezzanine which was where I was seated. So I don't know if it was only because of my seat location. I was surprised too that the show has bits of humor most of which came from Ms. Russell. The other cast members such as Jessica Molasky, Mary Beth Peil were great but Alexander Gemignani's voice just stood out for me clear as crystal. Another star in this production is the projections. Literally before your eyes, as George would draw on his sketch pad, you'd see it coming into life in the scenery behind. You hear an audible gasp from the audience when you see the painting come to life onstage. It's very thrilling so see. But a very memorable moment for me is at the end where you see young George looking at the scenery of the Island of La Grande Jatte and then it disintegrates into just white walls and you hear the words uttered "like a blank canvas.......so many possibilities" as you hear George gasp in excitement. It's a powerful image to see. It was BC/EFA collection time for Easter Bonnet so Jenna Russell was by the exit doors at the end of the show collecting donations. I got to chat with her a bit and complemented her on her performance. She said she's really excited to be on Broadway and then said thank you and shook my hand as I left. Gypsy is a musical about Mama Rose and her 2 children June and Louise. It's based on the memoirs of Gypsy Rose Lee. It tells of a mother's obsession to get her child, well first it was June and then she moved onto Louise, to be a star on stage. The show is very accessible and has really good familiar music and according to a lot of people, has the best overture of a musical. I must commend the director's decision to have the orchestra on stage. It's very fascinating to get to see a full orchestra play that overture! When the actors onstage all inhabit the same dramatic plane, creating a seamless world, a play can become something more than a performance. Your sense of time drops away, you cease to see actors and see only people, you enter a fully imagined realm in which every detail of emotion, action and language is perfectly aligned. A playwright’s words become entrancing music that can linger in your head for days — be it exalting, despairing or merely diverting. That's how I felt seeing the show..........transported! Well, it was crazy at the stagedoor. Good thing Mike and Tom stayed with me to get playbills autographed because they don't normally like to do that. Mike even commented that he feels like a paparazzi. LOL! We didn't have to wait long though and most of the actors came out. I was actually intimidated by Patti Lupone because she's just so iconic for me but she was really nice. Security had announced that she won't be posing for pictures before she came out. 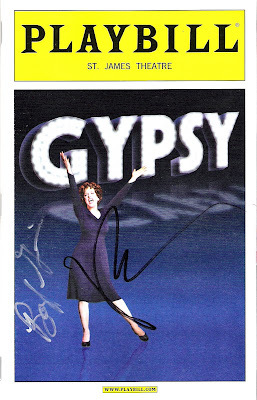 She did however, try to sign everyone's playbill and was chatty that night. Laura Benanti didn't come out of the stagedoor. Prior to this show I had actually heard that she had walking pneumonia during the week and didn't do shows until Friday night. I was glad she was there that night. Oh before I forget, during the start of Act 2 someone from the audience yelled I Love You Patti......that was really amusing!